Defending champions Craigengower Cricket Club (CCC) opened up a lead of eight points in the Premier League Division 1, after just six games into the new season but they have played one more game than most of the rest. CCC, who slipped to second three weeks ago, retook the lead two weeks ago when the previous leader Kowloon Cricket Club (KCC) suffered a loss of 0-8 at Hong Kong Football Club (HKFC). CCC travelled to newly promoted Hong Kong Cricket Club (HKCC) last Saturday, June 2 and faced a tricky away match. The results of the three rinks were tight, only the rink skipped by Lee Ka Ho was won by a big margin of 11:28. Kevin Fung’s rink lost by 21:15 and Jordi Lo was trailing his opponent Glyn Davies by 21:10 into the last end. Davies was holding a shot when Lo just had the last bowl to play. If Lo cannot turn it, HKCC will win it by 6-2. However Lo maintained his composure to trail the jack in his favour and ended up with a shot. Third and fourth placed HKFC-A and KCC both won their games 6-2 at home and their positions remain unchanged. Bottom club, Club de Recreio won their first game and first points of the season after defeating Kowloon Bowling Green Club 2-6 away from home. They are now just a point behind HKFC-B while KBGC are just another eight points above. 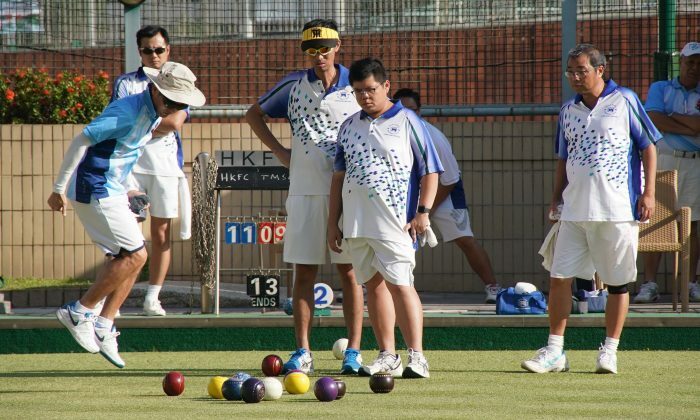 For the women, 2016 champions Shatin Sports Association (STSA) leapfrogged the defending champion Island Lawn Bowls Club (ILBC) into the leading position but they have played one more game. Both teams played at home last weekend, STSA defeated CCC 8-0 and ILBC defeated Tseung Kwan O Bowling Club 7-1. STSA now has 32 points, three points more than ILBC. Third-place KCC follow with 26 points. The Premier League continues this Saturday (June 9) at 2:30pm at all greens in Hong Kong.